Four months ago, one of my mummy friends emailed me to ask if I’d like to join her on the Moonwalk London. She suggested that we walk 26 miles in the middle of the night, in our bras. I don’t know if I was more horrified at the prospect of wearing a bra in public, or walking 26 consecutive miles. Before I could reply back (telling her that she had probably emailed the wrong friend), she emailed to say that perhaps we could do the half marathon instead. Upon reflection, and after looking at the Moonwalk website, I hesitantly agreed. If you’re not familiar with Moonwalk London, it is a nightime walk to raise money for breast cancer. Wearing the bras is a way to show solidarity as well as to raise awareness and to just have some fun. Walk the Walk organise the Moonwalk challenges (in the UK and abroad) and this year was the 20th anniversary of Moonwalk London. 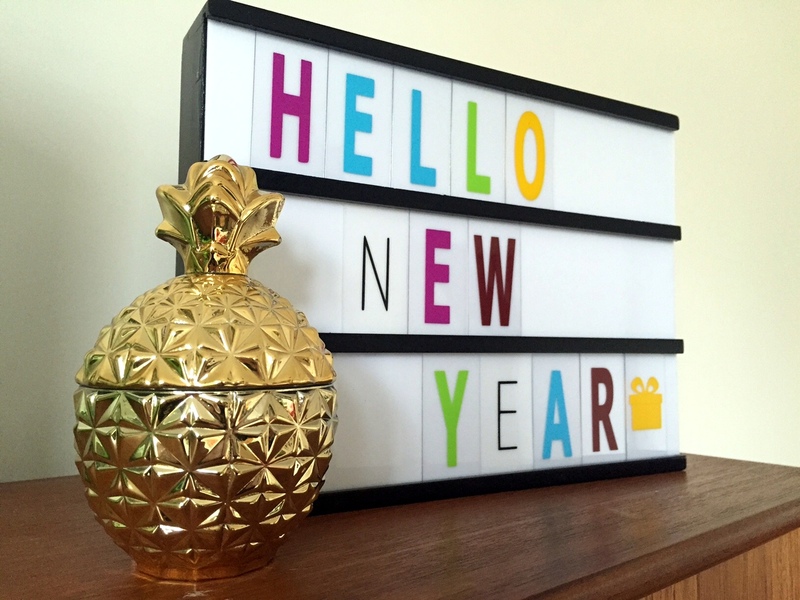 Every year, when people talk of New Year’s resolutions, I explain that I don’t do resolutions. For years I have explained to friends that resolutions shouldn’t be saved for the first of January. If you want to change your life, then just do it. But the last few months have passed in a whirlwind. And I have spent so much time focusing on others, which means that I have neglected myself. But this needs to change, and January will mark the new year of the new me. I shouldn’t really say ‘new me’. I plan to remain the same old Elfa. But with one major tweak. I am making fitness and healthy eating as priorities in my life. This is the year where I will finally get fit and tone up. Part of that is definitely losing some of the baby weight. Long-term readers might remember that I managed to lose a stone and a half (21 pounds) in 2015 in preparation for my 40th birthday. Sadly I gained all the weight back last year, plus a few extra pounds for good measure. That’s the kind of title that catches the eye of many mums who are struggling to lose that baby weight. I would like to lose my ‘mum tum’, and losing it in one week would be even better. But let’s face it, it’s not going to happen. It isn’t physically possible, and certainly not done in a healthy way. We live in an age where we have a huge access to information. If we want to know about something, we Google it. As someone who has been struggling with weight issues for years, I cannot tell you how many times I have browsed the internet for queries on dieting. I say dieting, but I mean healthy living. I don’t want to diet in the traditional sense. I want to eat healthy, unprocessed foods. I want to be fit and active. At the same time, I want to eat ALL the cake. I have been searching the internet to find a way to lose weight whilst eating cake. No luck yet. But I could cut down on the cake and find some ways to rid myself of this baby weight. And I’m not the only one looking for help. According to research from Intel Security, over half of people in the UK, between 21-54, have admitted to clicking on a link for a diet program/product. People are mostly clicking on links about ‘losing belly fat’ and ‘clean eating’. And 18% do so after having a baby. So many of us are trying to get healthy, and there are so many sources offering help. Some sites are safe, and some are not. From the title, you may think that I’m writing about a new plant-based superhero film. But this post is actually about Flora spread. A few days ago, I was invited to learn more about Flora and how it is made. And it turns out that Flora is made from plants. When many people think of margarine or spread, they assume it is filled with a lot of nasty, artificial ingredients. 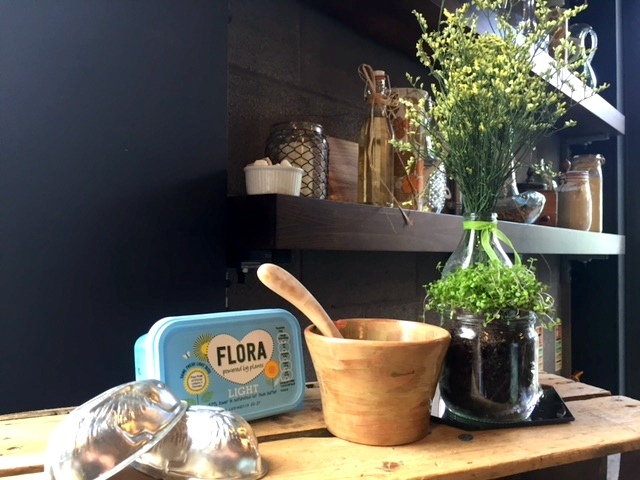 But Flora is made from linseed, palm, sunflower and rapeseed oils, which are full of healthy fats and omegas. I can’t believe it is already August. When I began my healthy living regime in March of this year, it felt like I had ages until my birthday. But here we are, just two weeks away from 40. July has not gone to plan (which was why there was no update). After Dubz had to go to the hospital for an asthma attack, I was at the mercy of hospital food for a couple of days. Then I had a week of stress-eating as I waited for him to get back to his old self. Then we went on our camping trip. Not surprisingly, I did not lose any weight. Luckily, I did not put on a pound, despite all that. But I will not dwell. June left me with a 22-pound weight loss. Although my original goal is 42 pounds, I will not give up. No, I won’t be able to lose the remaining 20-pounds in the next two weeks. But I will lose the weight (though the new plan might need to be ‘Fit By Christmas’). I am back to healthy eatin g. And back to the gym. I have really enjoyed my workout sessions (though I am not able to go three times a week in the summer holidays). But it turns out I love sweating. 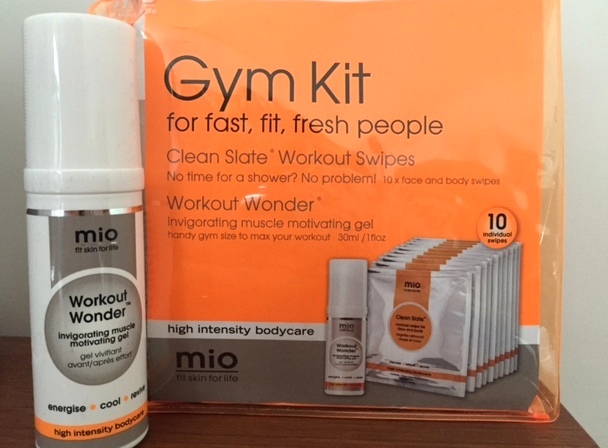 One item that I’ve been enjoying using after my gym sessions is the Mio Gym Kit. I do not like showering at the gym. 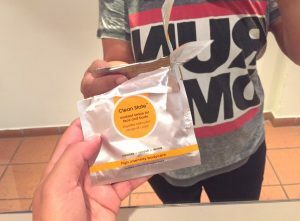 So I have been using the Clean Slate workout wipes, which keeps me from feeling gross and sweaty. It’s like a baby wipe but stronger. And it has the loveliest smell. Like all Mio products. I just wipe, and then throw it away. And I can run errands smelling nice, then go home and have a shower. The gym kit also contains a muscle recovery gel in case your workout session has left you achy but you still need to do grocery shopping and pick up the kids. 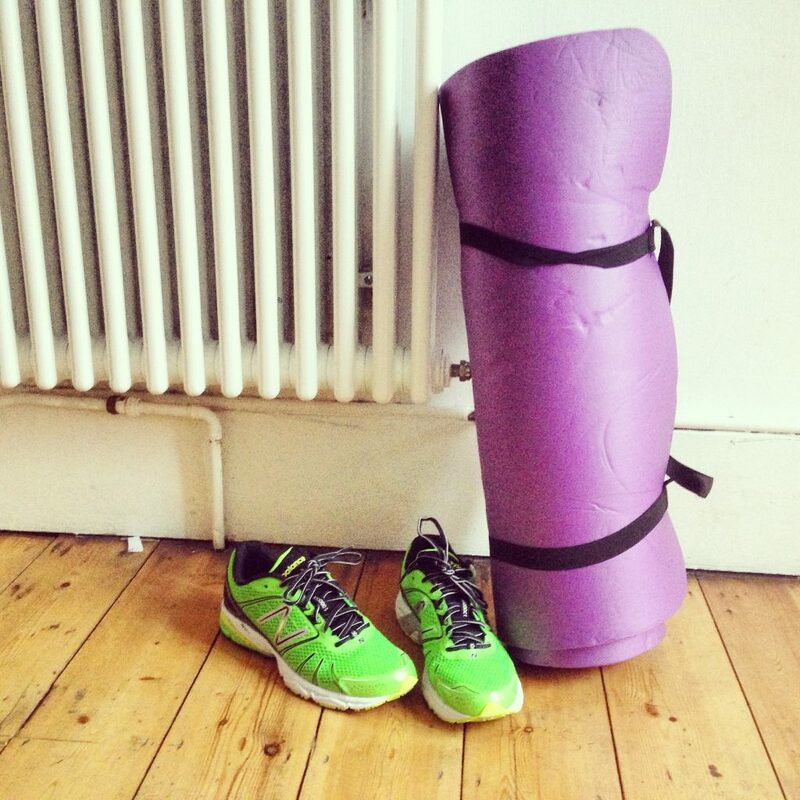 I was sent the Mio gym kit from John Lewis Kingston for the purpose of this review. All opinions expressed are entirely my own. I have been on my healthy living/fitness regime for three and a half months now. And I have to admit that I am struggling. This past month has been difficult. Rather than having one day off at the weekend, I have been having two or three days off. And I took about two weeks off during the May half-term. But despite my love of sugar and carbs, I have continued going to the gym two or three times a week so the month hasn’t gone too badly. My last weigh-in was last week on Wednesday. At that time I had lost four pounds for the month, bringing my weight loss grand total to 22 pounds. Last month I was disappointed by my four-pound loss. But this month I am not surprised by the small loss as I don’t think my body could continue with the half stone losses each month. And although my clothes have been fitting better (and I have been able to wear some old clothes), I don’t think I look like I have lost any weight. Obviously it is tough to notice when you have a lot of weight to lose. But I feel like this is effecting my motivation. This week we are on holiday, so I have been off the diet since last Friday. But I hope to return to my healthy living regime on Sunday. And I am hoping to reduce my cheat days back to once a week. I have seven weeks remaining until my 40th birthday and still have over a stone to lose. Yikes! If you have any advice, I would love to hear it. It’s been two and a half months since I began my healthy living and I am so pleased with my progress so far. I was in Florida at the end of April/beginning of May, so I did take a few weeks’ break from my no gluten, no sugar and no dairy lifestyle. But how can you go to the USA and not eat pancakes, fried chicken and buttermilk biscuits? Hmmm, buttermilk biscuits. Anyway, before I start daydreaming about unhealthy American food, let’s get back to healthy eating. 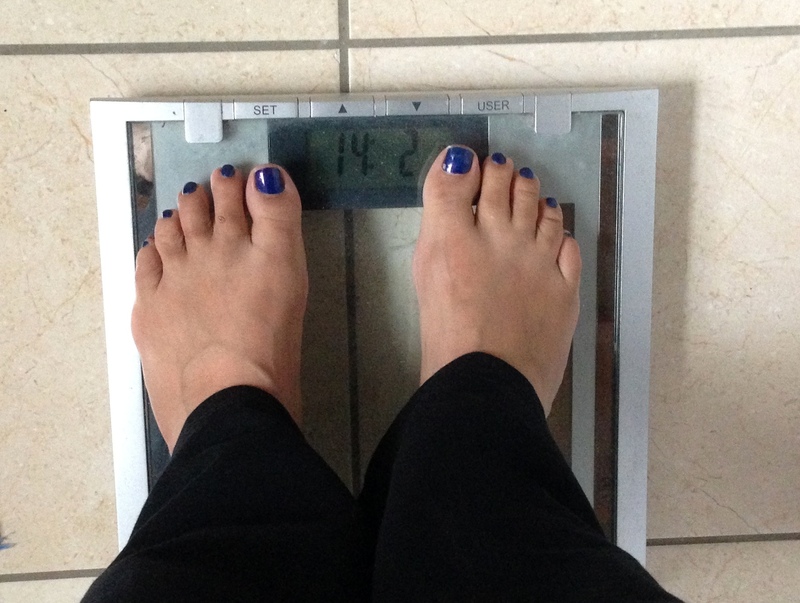 In the March update I revealed that I had lost seven pounds in the first 2 1/2 weeks. I lost another seven pounds for the April update, making it a total of one stone (14 pounds). This month has seen less of a weight loss. This has not come as a shock as I took time off from the diet to gorge on ribs, washed down by copious amounts of margaritas. I am actually surprised that I did not put on any weight in Florida. My weigh-in revealed a weight loss of four pounds, which I am happy about. I am now at a total of 18 pounds which is almost half of my goal of 42 pounds (3 stone). Since last month’s update focused on healthy eating, I thought this month’s update would focus on exercise. While I firmly believe that what you eat is the most important part of losing weight, I think that exercise is a firm second. I have found a local yoga class. Though I have only attended a few times, I have enjoyed the hour of stretching and toning. In March, I joined my local gym. I have previously tried doing exercise DVDs at home, but too often I would put it off. And since Dubz now attends pre-school three mornings a week, I couldn’t make the excuse that I did not have the time. And when I have had particularly busy weeks, I have been heading to the gym in the evenings and on the weekend. 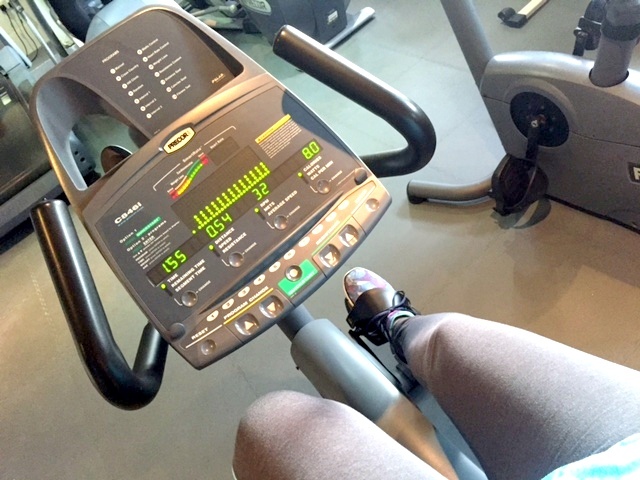 I began just using the stationary bike, followed by a few stretches and abdominal curls. After so many years of not exercising, I did not want to do too much and injure myself. I now alternate between the treadmill and the elliptical trainer. I then do abdominal exercises before either using free weights on my arms or the machine leg weights. Even though I only workout for an hour twice a week, I feel like my body is more toned. 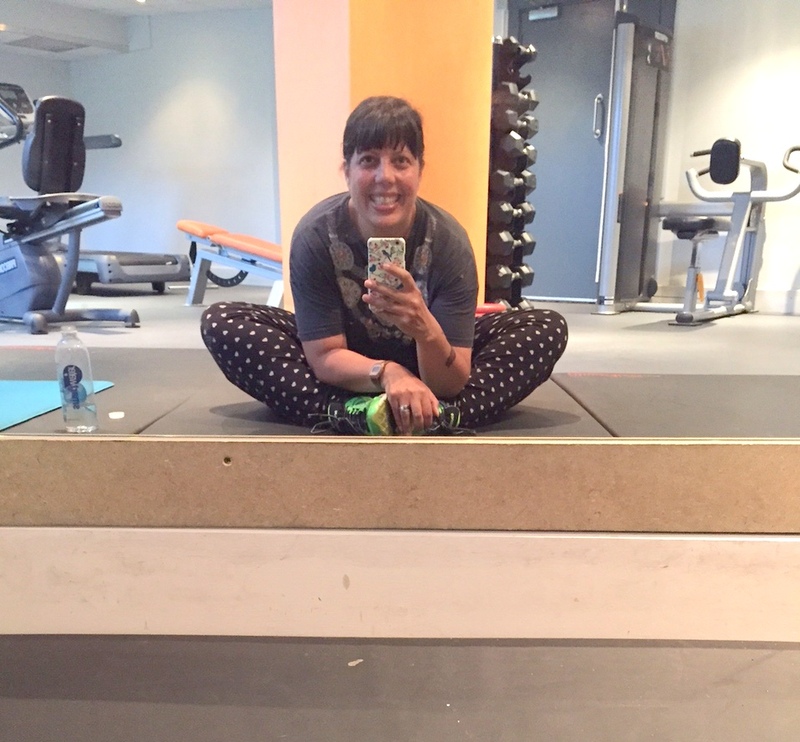 I would obviously prefer to go to the gym three or four times a week, but I am busy and I cannot always prioritise exercise over blogging and chores. It is now almost exactly three months until my 40th birthday. Hopefully I can lose these next 24 pounds and become fit in time for 40. Welcome to another edition of Cooking with Californian Mum. I am not the best cook, but I have been working on it. I was recently given The Clean-Eating Kitchen to review. 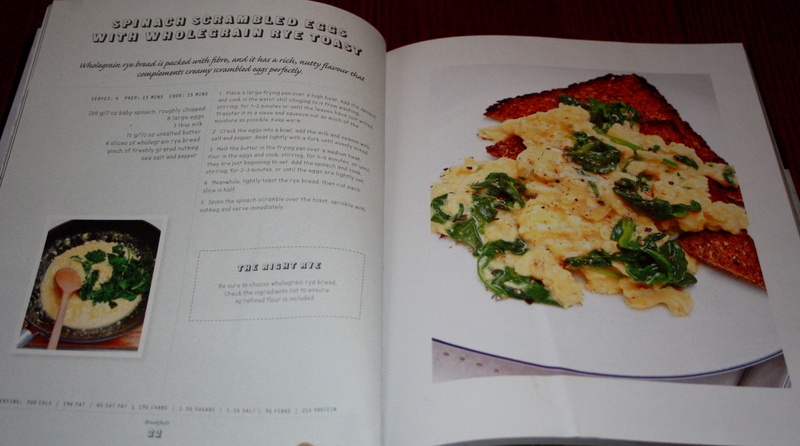 As I am trying to eat more healthy, I was keen to try this cookbook. 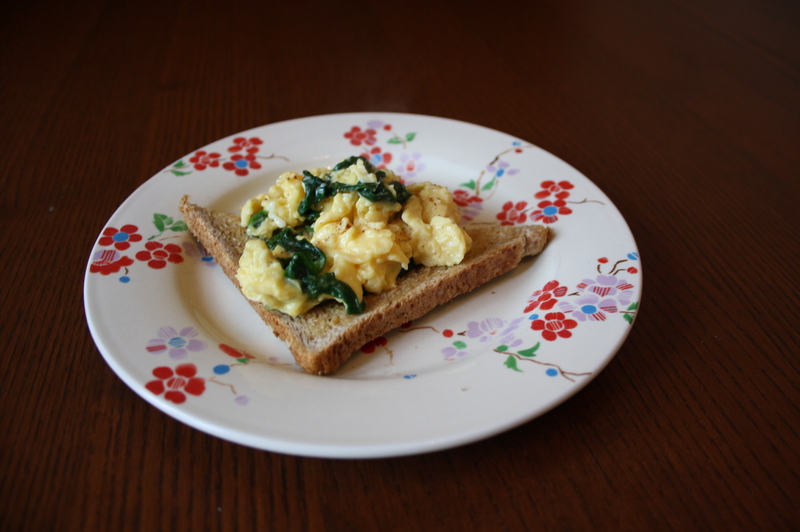 At the weekend I decided to make myself scrambled eggs with spinach. I love eggs, and as they are a good source of Vitamin D, I am trying to eat them two or three times a week. I adore scrambled eggs. But the two times I have tried making them, it has not ended well, and the eggs did not turn out very scrambly. But I followed this recipe exactly, and voila! Perfect scrambled eggs. They key is to keep it on low heat, and continue stirring for 4-5 minutes. The addition of spinach and nutmeg really enhanced the taste. And as I’m trying to eat more vegetables, this is now my new go-to lunch. There are some other great recipes that I plan on trying, including The Healthy Breakfast Frittata, Courgette Fritters and Mushrom and Egg Cups. Yummm. And tomorrow night I will be making the children the Seared Wild Salmon. New Year. New healthier us. 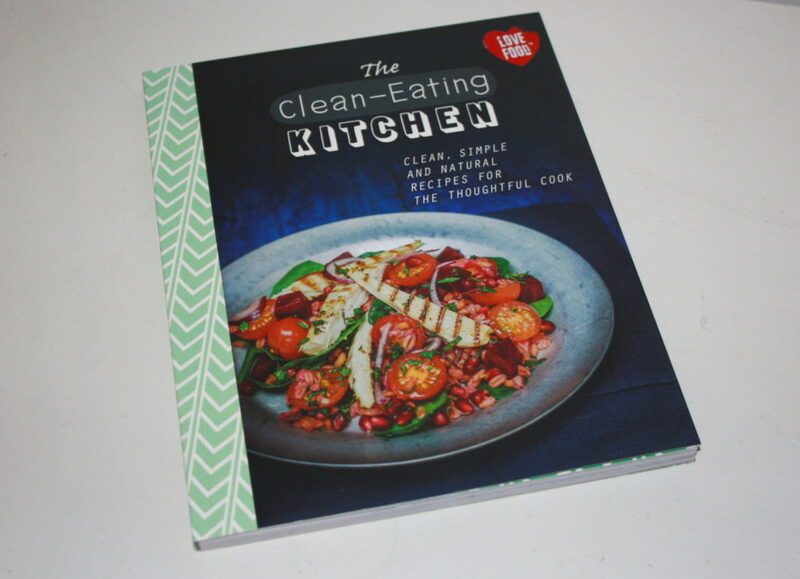 The Clean-Living Kitchen retails for £6.35 on Amazon UK. I was sent ‘The Clean-Eating Kitchen’ for the purpose of this review. All opinions expressed are entirely my own. I can’t believe I have just finished 28 days on Diet Chef. It has really flown by. Above are some of the yummy foods I have enjoyed – as breakfasts, lunches, snacks and dinners. As this will be my final post on the meal delivery programme, I thought I would go through the highlights of the past month. 1. The Food – I think it is a huge plus to be able to choose which meals to have each month. This is especially helpful if you continue with the diet as you can select the meals that you thought were really tasty. 2. The Ease – There is no weighing or calorie counting. The three meals and snack allotted for each day are worth 900-1100 calories. This gives you a few hundred calories to spend on whichever fruit and vegetables you like. 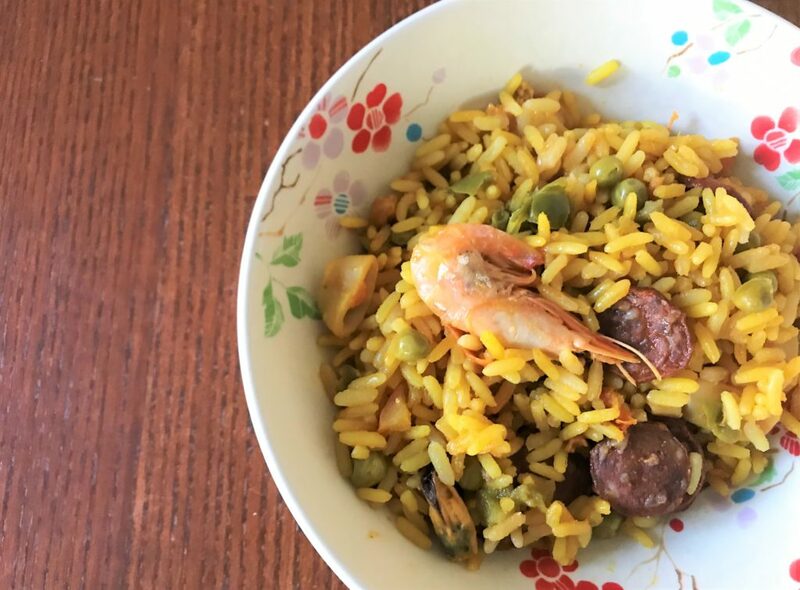 There is also the added bonus of not having to make dinner every night (although I still cooked dinner for the kids, Husband and I just microwaved our Diet Chef dinners every evening). 3. The Results – I was thrilled to lose 2-4 pounds each week, although 1-2 pounds is probably more of a normal loss. But my body was so accustomed to a high caloric intake that 1400-1500 calories really made a huge difference. Husband and I are fans of the sneaky nightly chocolate pudding/candy bar. 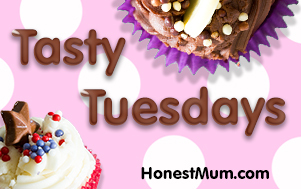 But we resisted on the diet and even this week have not gone back to our old, sneaky ways. Woohoo. So, after 28 days of Diet Chef, I weighed myself and was happy to find that I now weigh 14 stone 2 pounds. That is a 10-pound weight loss. My clothes are fitting better and I can start to see my cheekbones again. Cheekbones. Squeal. So thank you Diet Chef. Husband has lost eight pounds and is also pleased. But the healthy eating and the exercise is far from over. 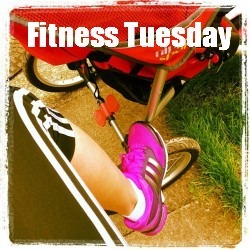 I will be continuing on my Healthy Living Lucky Dip, as I still have two stone of baby weight to lose. So stay tuned. 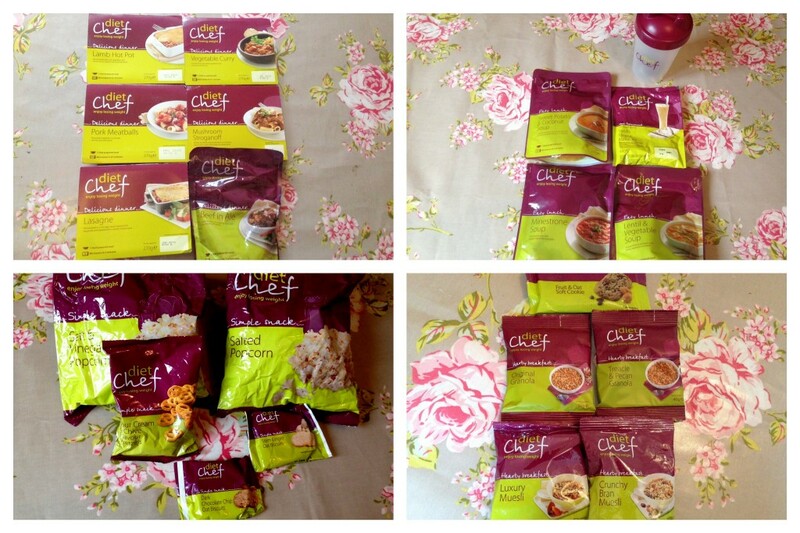 I was given a 28-day supply of Diet Chef for the purpose of my weekly reviews. Husband paid for his own. All opinions expressed are completely my own.